Crab Soup Cook-Off - ABC Events, Inc. The Maryland Seafood Festival invites you to participate in the 29th Annual Crab Soup Cook-Off. 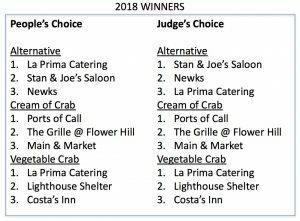 Restaurants and caterers throughout Maryland will be vying for the right to call themselves the “Premier Creator of Crab Soup” – gaining valuable exposure for their business. Festival attendees can purchase a Crab soup tasting ticket for $10 for entry in the crab soup tent. Vote for your favorite and participate in the people’s choice. Showcase your restaurant in a competitive and festive atmosphere! This year, the Maryland Seafood Festival is expected to draw over 20,000 visitors during two days of family activities, entertainment and delicious seafood dishes. The Crab Soup Cook-Off is the highlight of the Maryland Seafood Festival’s first day with over 1,000 soup lovers passing through the tent just to sample your soup! For more information, download the 2018 Crab Soup Cook-Off Brochure.